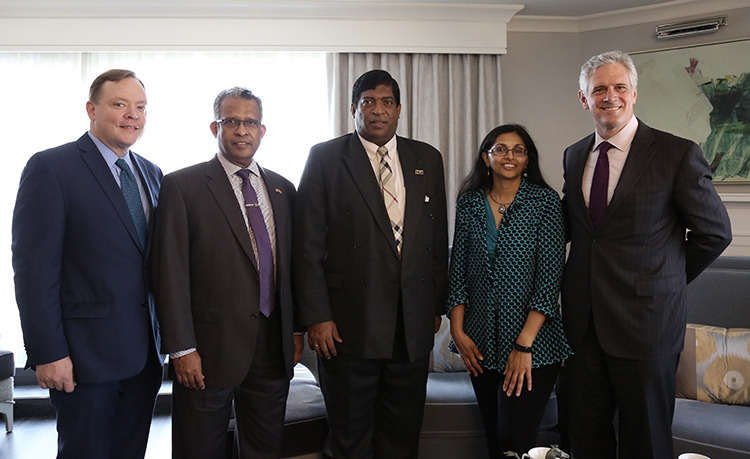 Following the landmark deal by Hilton to manage six more hotels in Sri Lanka, senior management of the Hilton met visiting Finance Minister Ravi Karunanayake in Washington D.C. on the sidelines of the ongoing World Bank and IMF meetings. Senior Vice President of Hilton Jonas Neihardt met with Minister Karunanayake, facilitated by Nisha Biswal, Senior Advisor of Albright Stonebridge Group, to brief on measures being taken by this renowned global hospitality company of the United States to strengthen its market footprints in Sri Lanka and to discuss initiatives for further expanding its presence in Sri Lanka, described as one of the most sought-after destination in the world, at present. 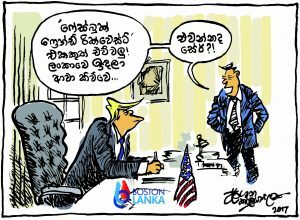 The discussions centered on how Hilton Group could not only manage more hotels and resorts in Sri Lanka, but as to how the Group can promote Sri Lanka as a destination among American public, and worldwide. The media release issued by Hilton (attached below) entitled “Hilton Signs Landmark Deal for Six Hotels in Sri Lanka” provides details of the new properties that will come under Hilton management at several prime destinations within Sri Lanka.